Hello again, can you believe that I am back so soon? I realized that I had barely touched on the many things that made up my interesting summer! Below is a picture of my guild's raffle quilt for this year. This quilt was designed by Gina Gempesaw for County Line Quilters, pieced by guild members and machine quilted by me, Sally Malley finished it with her perfect binding. Our quilt guild hosts a non-juried show every 2 years in the spring, it will be in late March this year at Archbishop Wood High School. Isn't it beautiful? I love the bright, happy colors in this design and the large blocks really stand out! 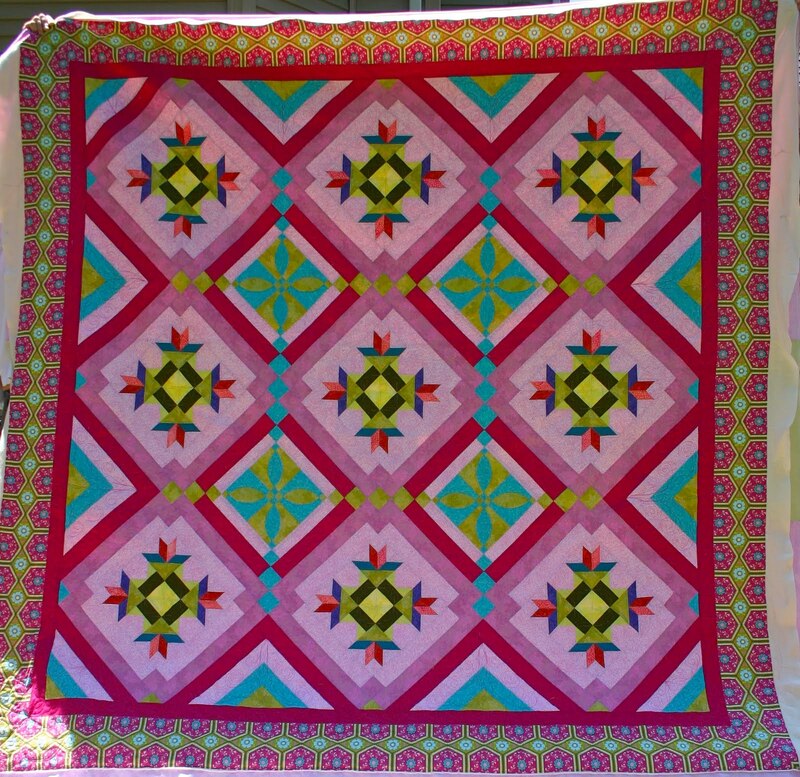 Oh I'd love to win this quilt! On a very sad note our Beautiful Morgan has gone to the Rainbow Bridge, I'd always asked her to make it to 13 years and she did, she turned 13 in May a left us in late June. I miss her so much! 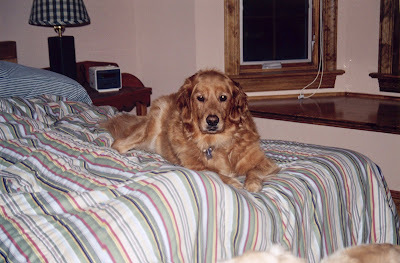 This is Morgan on Trevor's bed, wasn't she just gorgeous? 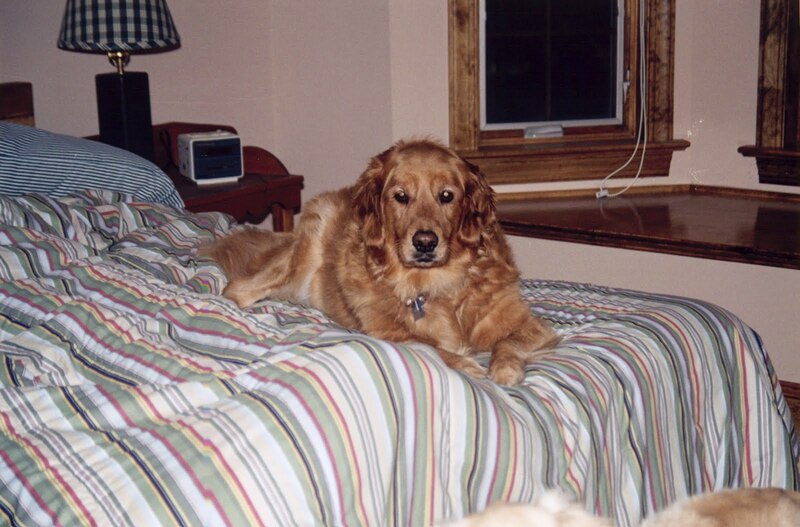 I used to send Morgan and Daisy in to wake Trevor up, they'd jump on the bed and play around. Trevor was not easy to wake up! God Bless you Morgan, you made our lives so much richer in so many ways and you are missed my beautiful girl! As I write this I am watching my Ninja Hummingbird guard the feeders, she is fierce in her desire not to share the nectar! The chases are comical and I could watch them and their beautiful shiny green feathers all morning. Mr. Rusty is at my feet, he never goes far any more it's like he's decided I'm his since Morgan left us. In looking at my red golden retrievers and the green hummingbirds and can see a beautiful copper and green quilt, the colors are rich and would really shine together. Isn't it amazing how nature inspires us? Look around you and be inspired, after this hellish summer with it's prolonged heat waves and then the devastation of Hurricane Irene we have much to be thankful for. For me autumn is a wonderful season, the colors, the scents and the crackling leaves on the ground. I love the shorter days and cooler nights. I am inspired to create quilts and food. Autumn is a time to gather and prepare for the possibility of winter, I relish this time. Our guild will start meeting again in September as will many guilds, we are starting off with a Tea Party this year! I can't wait to see everyone and what they have created over the summer! I will get to have lunch with my good friend, Donna Lynn Thomas this week, she will be coming back east to promote her newest book and visit family. Spending time with her is amazing, she is so creative and inspiring! Enjoy the last official weekend of summer, your family and friends and maybe you are inspired to create something for yourself to remember your summer of 2011 by.